Love this! Thank you for breaking it down so well. 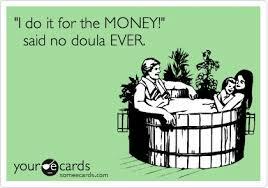 Hiring my doula was the best decision I ever made and was money well spent. I don’t talk about it enough…but I don’t know many pregnant women…the next time I run across one I will remember to talk about my doula and how she was a blessing. I just LOVE what you write in your last paragraph in the “Keeping It All In Sycnh” section Jodi!! You brought tears to my eyes. Birth is an amazingly intense and beautiful experience. Thank you for attending mine as Marla’s back-up back in January! I am still a little sad that I didn’t make it through all natural, but I still hold out strong hope and aspirations for my next birth G-d willing! Your intuition about the needs of a birthing/immediately post partum mother are spot on, amazing and a clear manifestation of your years of experience at births. Your love for what you do is clear in the way you do it. Thank you. I continue to spread the word and encourage others to hire doulas. Continued strength and inspiration to you in your calling! Thank you for addressing fees to the doulas in your readership, as well. Doulas need to charge the fee that their time, work, skill, and experience is worth! Additionally — when the incoming business is somewhat reliable and we don’t need to chase after every inquiry that comes our way — I encourage doulas to take time off – like their birthdays, or Christmas. Make back-up plans, because there is always a doula willing to take the back-up role, if back-up is ever needed. I always take Dec 24-25th off, and I have never had a problem finding back-up. I try to choose my EDD’s carefully (so maybe nothing from Dec 15th through New Year), but I have never lost a contract because I state ahead of time that I will be using back up on those 2 days. While my children are small, I also do everything I can to get back-up for their birthdays. Like I said, there is a right time for many doulas to do this, usually after their business is well-established. I take time off as well Maria. I tend to take August and December off. That’s when I can concentrate on doing lovely things with my family and just chill out. I think that regular time off helps prevent burnout. Like you Jodie, this is what I am meant to do. Thanks for articulating my thoughts when talking about fees. Much appreciated. In addition to the doula activities you mentioned, even the most established doulas I know in my city spend an awful lot of time interviewing for jobs. Most in my area will do two to four interviews for one actual job, so that commuting and time spent should also be factored into your estimates. I’m so glad you wrote this. It came at the perfect time for me. I often laugh when people question how much “alternative” contractors get paid. Now when I say alternative, I don’t mean it in a hippie or grunge culture way, I mean it “as opposed to” licensed contractors like electricians, plumbers or even surgeons and anaesthesiologists. Now it’s not just the 3 hours we’re on stage that we’re getting paid for. We buy our instruments, we rehearse, and we spend time learning all the latest songs in our own time away from the rehearsal space. We often travel longer than 30 minutes to get to the gig; sometimes it’s an hour away, sometimes (although there’s a premium charged) we are travelling for 2-3 hours. Your party might start between 6pm and 7pm and whilst we’re not hitting the stage until 9pm and playing until midnight, we’ve been there since 4pm setting up. Now I relate that back to OUR experience with a doula. We were lucky. Our doula is a midwife by profession but was a doula in training. As a result she charged us $300 which was nothing to blink at. But what she did was meet with my wife alone on two occasions and with me there as well at least once, maybe twice before the big day. And she got the call in the middle of the night when we had the first false start which resulted in nothing, but was there in a flash a few days later when it was game on. Thank you for writing this article, it is so true and really puts into perspective the practical value that people get from engaging a doula. However there is also the deeper value that only doulas and parents who have engaged doulas can truly understand. Hi Jodie! This is incredible! Is it ok if I put a link to this from my website? You break it down so succinctly, I would love to be able to refer to it with clients. By all means, this is meant to be shared! Please just include my name and a link, if you would. If our doula had been charging three times the amount she did, she’d still be worth every penny for the invaluable support I received. Completely priceless.